Born in Piotrków Trybunalski on 11th April 1977. In 1997–2003, he studied at Cardinal Stefan Wyszyński University in Warsaw. 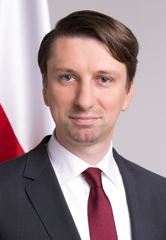 In 2003–2011, he undertook postgraduate studies in various fields including Corporate Law at the University of Warsaw, Human Resource Management at the Warsaw School of Economics, Management in Public Administration at the Leon Koźmiński Academy of Entrepreneurship and Management in Warsaw, and Project Management at the Warsaw School of Economics. In 2006, he passed the state examination for candidates for supervisory board members in companies with State Treasury shareholding at the Ministry of the Treasury. After graduation in 2003–2006, he worked as a Head of Department at the City Hall of Warsaw. Since 2006, he has been associated with the Ministry of Culture and National Heritage. He was the Director of the Legislative Department, for which he performed duties in relation to legislation, copyrights, media law, and legal services of the ministry. During his term as the Director of the Department, he was also assigned to the duties in substitution of the Director General of Ministry of Culture and National Heritage, which he performed until 2008. In 2009, he started working at the National Audiovisual Institute. As Deputy Director, he managed digitization, archiving, education and information technology, and supervised legal and investment tasks and international relations. In 2014–2016, he worked at the national TV broadcaster Telewizja Polska S. A. as Director of the Documentation and Programme Collection Centre, where he was responsible for, among others, digitization, archiving and sharing of the programme resources of this public broadcaster. He contributed to the digitization of popular film and television works. He was responsible for developing the principles of the largest digitization programme of the TVP collections—financed by the European Union. He acted as the Vice-Chairman of IFAP/PNC for UNESCO and was a member of the Program and Scientific Council of the National Film Archive. On 25 January 2016, he was appointed to the post of Director General of the Ministry of Culture and National Heritage.